I made my first trip to Ravenhurst a few months ago. It is exactly one hour from my Clintonville Chateau. 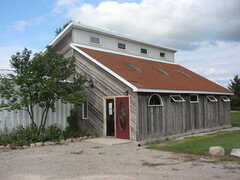 This year I have made an effort to learn more about Ohio wines and was intrigued to find a winery near Columbus. There are over 100 registered wineries in Ohio but only a small number make wines exclusively using their own grapes grown in their own soil. Ravenhurst is one of these wineries. Most Ohio wineries are located near lakes and rivers for the benefits bodies of water give to the growing of grapes. Ravenhurst’s geography is a bit of an anomaly but it works well for the unique fruit forward flavors of the wines. These seemed to be ample reasons to visit so it was time for me to hit the road. The climate and soil of Ohio can be a terror on the terroir of an Ohio wine. At Ravenhurst, they used ingenuity to turn the tables in their favor. By drilling down four plus feet into the clay infused soil of the region, the vines are given a protective sheath to protect them from harsh Ohio winters. Ravenhurst produces about a dozen styles of wine. 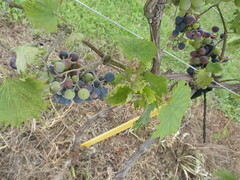 About one half are champagne style wines including an interesting Petit Rouge which blends Pinot Noir and Chambourcin grapes. Ravenhurst also pours and produces a few white, red and dessert wines. Tastings are offered on select weekends. 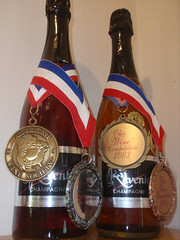 Ravenhurst wines have won a fair share of domestic and international awards. Distribution is limited to the winery, a place you may have heard of called the Refectory, The Plaza Inn in Mt Victory and the Mt. Victory Drive Thru. Owner C.A Harris is an experienced chef as well. 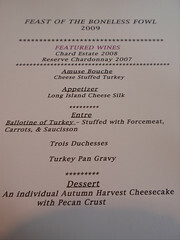 Ravenhurst hosts several cooking demonstrations / dinners paired with their wines during the year. Chef Harris cooks and instructs while guests drink, eat and learn. I headed back to Ravenhurst on November 7th for the Feast of the Boneless Fowl. 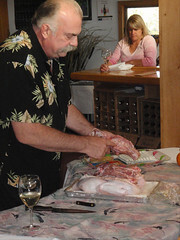 Chef Harris showed us how to deconstruct a turkey to make a boneless Thanksgiving feast. 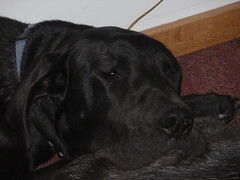 We watched on as he deboned, stuffed, (forcemeat) and sewed up the turkey for cooking. The cost of the class paired with a meal and several pours of wine was $29.95. Chuck Harris and his wife Nina are joined by Jonda and Richard Anderson as your hosts at the winery. Tastings are a relaxed affair. The people behind the counter are knowledgeable about their wines and how pair them. Jonda in particular was helpful, loaning me $4 so I could buy a bottle of the Grand Cuvee after I realized I had left my credit card at home and found my funds were limited. (I’ll gladly pay you Tuesday for a $38 bottle of champagne today….). 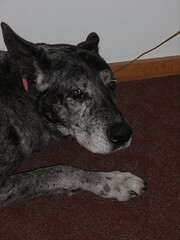 Guests also receive the wise counsel and company of the house dogs – Zeus and Hera. It is an easy and pleasant drive to Ravenhurst via SR 33 and 31. You could also take a variety of backroads up as well (such as SR 257), which I do on occasion to remind myself that Ohio is still farm country. I found the Feast of the Boneless Fowl to be a good value and well worth my time (as are the wines). 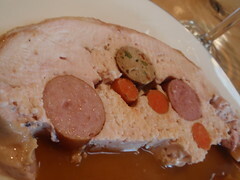 This entry was posted on November 8, 2009 at 9:56 AM	and is filed under culinary knowledge, Ohio, Road Trip, wine. Tagged: Ohio wines, Ravenhurst, Ravenhurst Champagne Cellars. You can follow any responses to this entry through the RSS 2.0 feed. You can leave a response, or trackback from your own site. Oh drat!! I heard about this last year and it sounded awesome… forgot to keep my eye peeled for it this year. Lesson learned (maybe). My wife and I have been attending the cooking demonstrations for the past several months. All have been informative and the food is really quite good. We’ve tried different wine and champagne offerings each time, and have found everything quite pleasing. We are attending another cooking demo this evening and have plans for the one in August as well. I’m looking forward to the boneless turkey demo this fall. My wife and I moved from Ohio in 2014 to another state 600 miles away. We still talk occasionally abut Chuck and Nina and those neat evenings at their place. I hope they are still continuing the cooking demonstrations as we found them to be very hospitable and knowledgeable. I just hope others learn of this place and make the trip to their winery.